So much in parenting advice has changed over the years. And one of the current trends we love (besides YDY — AKA: you do you!) is strength-based parenting, which is based on the principles of positive psychology. Unsure what, exactly, that is? We’re about to break it down in this interview with Lea Waters, author of The Strength Switch: How The New Science of Strength-Based Parenting Can Help Your Child and Your Teen to Flourish and the star of this popular TedX talk. Fit Bottomed Mamas: Why was this book so important for you to write? 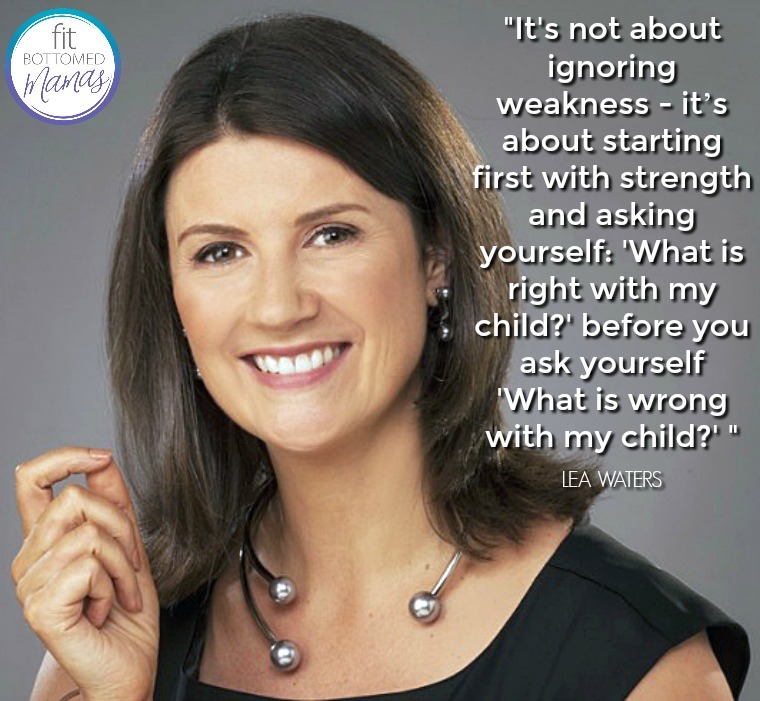 Lea Waters: I run strength-based workshops for parents around the world and I’ve found that no matter what country, continent, or culture they’re from, two things unite all parents: the desire to help their children flourish and a sense of inadequacy to this task. I wrote the book to help parents have confidence in raising their kids to flourish. Parents today have a lot more to worry about. My parents didn’t have to think about screen time, cyber-bullying, or sexting. Expectations of parents are growing, too. We’re raising kids in an era ruthlessly focused on grades, college admission, earning potential, and social acceptance. There also seems to be less and less consensus — and more scrutiny — on the “right” way to parent. We’re bombarded by conflicting approaches to raising good, successful kids. It can lead to anxiety about whether we’re doing what’s best for our child. We may feel so pressured to help our children grow into the person society says they should be that we may not be allowing them to grow into the person they actually are. I wrote the book to help parents navigate the complexity and scrutiny, to give them confidence that their children already have that pathways for their own development mapped out and this is in the shape of their strengths. FBM: What is strength-based parenting, in a nutshell? FBM: Does this approach apply to kids of all ages? LW: Absolutely! A big part of strength-based parenting (SBP) is you, as the parent, learning how to see and build strengths in yourself and others. You can start learning these skills and practicing this approach from the day your child is born (even before that). This way, as your child’s strengths start to show from the age of 3 onward, you will easily see and build their strengths. My research show that SBP is particularly impactful during the teen years when a young person’s identity starts to shift and be less certain. It’s a positive way for the parent-teen relationship to remain strong. I’ve also seen SBP have magic effects on older children who are in their young adult years. In other words, it’s never too early and never too late. FBM: Does any of your research suggest focusing on strengths might also be good in relationships, careers, etc., for adults? LW: The practice of strength-based parenting — to switch your attention first to what is going right before you look at what is going wrong — transfers to all relationships. Parents who learn to see and build the strengths in their kids repeatedly tell me of the ripple effect it has on their lives. Once you make the strength switch, your strength awareness spills over into your marriage, friendships, work relationships, and other connections. FBM: What’s one thing parents can do today to improve their relationship with their child? Start a conversation about the strengths of the family. When are you most happy at home? What are you proud of when it comes to your family? What is your happiest memory of being with your family? Use these questions to identify what are the strengths in your family that foster good relationships. Be open to the fact the during this conversation, some of the negatives and downsides will automatically arise — give space for these and then discuss how you can build up the strengths to allow the good times to outweigh the bad. FBM: If a child does want to improve upon a “weakness,” what’s the best way for a parent to address that or help them with it? LW: This may not surprise you, but I’m going to say ‘leverage off a strength.’ Understand what the weakness is and then look to find some strengths that your child has that can be applied to the solution. If your child is impatient, see if you can draw on their kindness to help them be more patient. If your child is struggling with math, see of they can draw on a strength like persistence to keep trying, or pro-activeness to ask for help, or creativity to look at the math problem from a different perspective. SBP doesn’t mean we ignore weakness, it just gives us a different way to address the weakness. It’s the same for discipline. SBP doesn’t ignore problem behavior, but is gets us to think about bed behavior as perhaps an overuse of a strength like when a child become bossy or dominant because they are overusing their leadership. Or when a child becomes stubborn when they are overusing their grit. FBM: Anything else you’d like to add? LW: To purchase your copy of the book The Strength Switch go here . For free resources and to find out more about the 5-week Strengths online course, visit www.StrengthSwitch.com. Use code 10Off for 10 percent off your purchase of the online course (valid for one month).